Whether you are temporarily out of action with a broken leg or have something more long term, double storey living can be a challenge. Making your way up and down the stairs can feel like you’re climbing Mt Everest. Luckily, the Residential Lift Company has created the perfect solution. The Residential Lift Company specialises in the design, manufacture and installation of small elevators for homes. With our range of personal lifts for home use, you can travel between floors with maximum convenience and safety whilst adding value to your home. The ResiLift is a lift like none other. This ingenious Australian design provides a unique solution to your access problems. The lift was specifically designed to fit into existing homes with minimal alterations, offering a safe, compact and affordable solution. Because the residential lift is the genuine patented, Australian made product, there is no need to wait for the product to be imported. It is here ready to install and improve the access in your home with minimum delay. The innovative design allows for maximum accessibility with minimum disruption to your home. Fully Australian owned and made, easy to install, and requiring very little maintenance or servicing, enquire about cheap home elevators today with The Residential Lift Company. To find out more, from the different model ResiLifts available, through to home lift prices, call us on 1300 303 522. Future-proof your home – In twenty years, expect to see a small residential lift in every newly built two storey home. Imagine how many people in your home will benefit from this inclusion. Make your home safer – having a domestic lift is not just for older people. Many people have mobility issues. Residential lifts reduce the risk of falls on stairs and allow you to move small items such as groceries, laundry and furniture between levels. Have more energy for the things you enjoy – Home elevators allow you to conserve your energy for activities you enjoy. Our clients often report that after installing a ResiLift they became more active. By installing a residential lift you save yourself the stress and expense of moving house! Investing in a personal in home elevator is significantly more cost-effective than relocating and it can be very difficult to find another home that is not double storey. 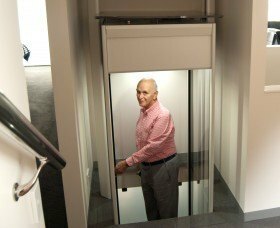 Makes your home accessible to people – In home lifts make it easier for other friends and family members who have difficulty on the stairs to visit you and share in upper level living. Installing a ResiLift adds safety, convenience and safety to any two storey home. With many more benefits to enjoy, there’s no better time than now to get in touch with The Residential Lift Company and discover how installing a residential elevator can benefit your home.